Concrete Admixtures are liquid or powder, added in gauging water of concrete. It reduces water content required for concrete thereby making it workable, flowable, compact and achieves high early strength. 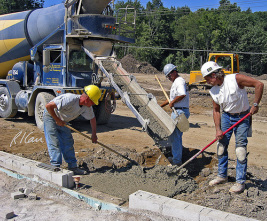 Unexpected delays while pouring fresh concrete can cause major problems. It also helps in delaying or accelerating ultimate setting time of concrete for cold or hot weather conditions, distance of placement and other factors. We also have various international third generation self compacting admixtures in which water reduction is very high & gives excellent pumpability in high rise buildings and large concrete elements. Available Self Compacting admixtures of various brands like SIKA, Fosroc, BASF and others.